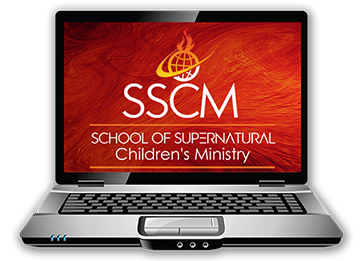 The School of Supernatural Children’s Ministry (SSCM) is a one-of-a-kind, correspondence training course for everyone who wants to equip a new generation to walk in the supernatural power of God. This course will rock your world as it relates to what it takes to raise spiritual champions in your churches and homes! The SSCM Training course comes in DVDs or downloadable MP4s. It is also available as an ONLINE COURSE! We have made SSCM easier and more affordable than ever. We have broken it down into three unique levels. Take all three levels, or just the one that is best for your specific needs and interests. Purchase one level at a time, or all three at once for a special price savings. Level One: Children’s Ministry Basics is perfect for those who have never been trained in children’s ministry, because it has 16 classes that cast vision, but also give practical, hands on training to help teachers give kids the meat of God’s word, shows them how to equip children for the work of the ministry, and trains them to take children into the presence of God for a personal encounter with the Holy Spirit every week. So even if you have been trained in other courses, we guarantee what you will learn here will be totally unique. A List of all 45 SSCM Training course topics.